The name Craigcannon appears only on the 6 map. Binnacaghig and Binnacolla are slightly lower peaks nearby on the same mountain. Craigcannon is the 1037th highest place in Ireland. Craigcannon is the most easterly summit in the Donegal NW area. 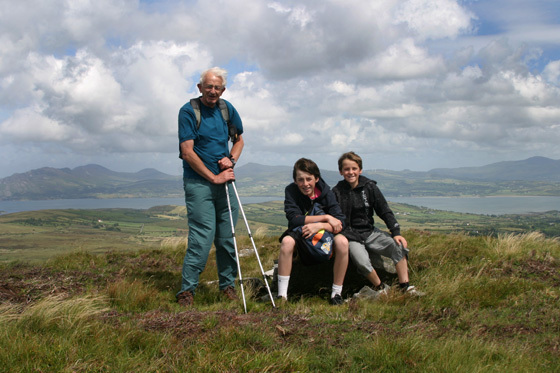 Picture from Harry Goodman : On Craigcannon with the Urris Hills, Bulbin and Slieve Snaght in the background. Picture: On Craigcannon with the Urris Hills, Bulbin and Slieve Snaght in the background. I got a bit lost on the approach and came upon my starting point by accident on a small road cutting through the high ground at 276295 F. This was beside a large concrete water tank and looked down on a church below. Cross fence and pass a small conifer plantation to open hillside, aiming for Croaghan Hill (305m). A significant area had been damaged by fire and blackened heather left Zorro like streaks on my trousers. Views were already superb over Lough Swilly, Inishowen and the Sperrins as i passed Lough Garnahalowen below. A long undulating walk over several tops was laid out ahead with the target of a trig pillar and wind turbines beckoning. The piercing cry of a kestrel was repeated as it moved quickly and then hovered, like a seagull on speed. The next top stood at 327m and had turf cuttings, with little piles of turf looking like camp fire practice for a gang of lost scouts. The massive blades of wind turbines dominate ahead and the souped up access road from the north. A rough track is joined at a line of telegraph poles and this is followed uphill to a lovely cairn with a makeshift flagpole on Crockanaffrin (344m). The trig pillar is a short distance away. The immediacy of the turbines is joined by those far off on Inishowen, all turning with a mesmerising effect. 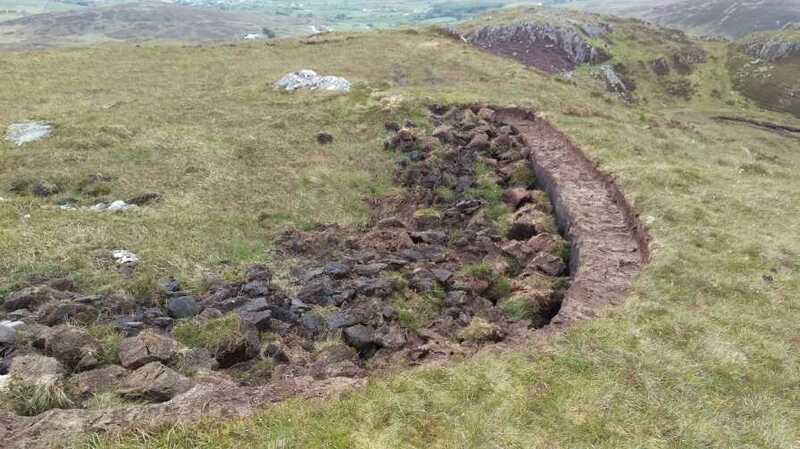 Drop down to the turbines and take a track uphill past active turf cuttings to reach the top of Craigcannon. Views to the north coast and Horn Head, Urris and Dunaff and the ferry crossing Swilly. The mighty Muckish, Errigal, Bluestacks and Sligo Hills were all visible. Dropped straight off the hill east to reach the access road. There was a newly erected memorial here to Fr Peter Hegarty who was killed in 1734 during Penal times. Continued east across some challenging ground in valley to Lough Garnahalowen - made up for with streams. waterfalls, lizards and bees. Then back uphill to start point. With a name like a 70's style tartan gang member - on map osi 2 - and no comments to boot, this hill was worth a visit! The minor road to the north of the hill offers little in the way of parking, giving its narrow nature. However, a short distance down the track, which leaves the minor road at 243315 A, there is enough space for one car, just get guided in as there is some masonry rubble to avoid, and not block this access track. How Far Can You Drive.